Our lights adopt LED as light source, durable, eco-friendly, low power consumption and energy saving. Flexible gooseneck design, you can arbitrarily adjust the lighting angle according to your need. Multi-use. Stable base can be used to stand on its own or clip to a book, shelf, cupboard, pianos, or computer. Easy to use. Fix the lamp with a clip and plug the USB interface to the computer USB port or USB charger, it can work. Portable and light weight. Convenient to carry with you and great for home, dormitory and office use. Adopts LED as light source, durable, eco-friendly, low power consumption and energy saving. Flexible gooseneck design, you can arbitrarily adjust the lighting angle according to your need. Multi-use. Stable base can be used to stand on its own or clip to a book, shelf, cupboard, pianos, or computer. Easy to use. Fix the lamp with a clip and plug the USB interface to the computer USB port or USB charger, it can work. Portable and light weight. Convenient to carry with you and great for home, dormitory and office use. Multi-purpose Design--The laptop light can be connected to desktop computers, powerbanks, laptops, battery boxes. It's very convenient to carry laptops when you walk out the door. Protect your Eyes--Delicate shape can be placed on the computer desk to save space, soft light lamp shade and strengthen the fill light , it avoids direct led light o protect your eyesight. Energy Saving Highlight--This USB LED lamp power is only 1W, voltage is 5V, lamp life up to 10,000 hours or more.Flexible soft color LED strips create new exciting lighting effects. 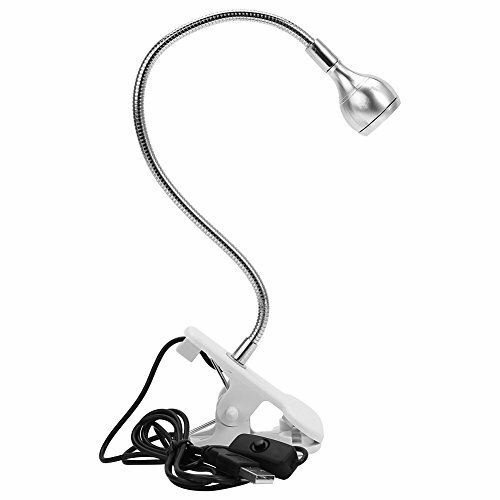 Adjustable Angle--The flexible gooseneck design can adjust the lighting angle according to your needs. No matter how you adjust the angle, it is not easy to break.It can be used anytime, anywhere. Easy to Carry--The USB notebook light is small in size and light in weight, only about 165 grams in weight, which is easy to carry.You can place beautiful shapes on your computer table to save space.